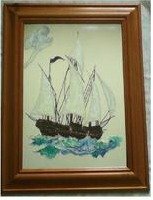 I love glass painting and have always wanted to paint a ship at sea. I was trying to create the feeling of movement. My mind never stops trying to find new and interesting pictures and attempting to recreate them with glass paint. Hi Jeanette! I so wish you had a bigger photo of your glass painting we we could admire the details.